Synopsis: You Are A Genius! is a guide to summoning the creative genius within. 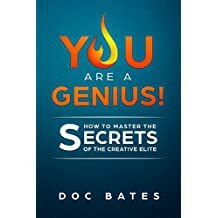 If you are passionate about stimulating your creativity and kicking it into the stratosphere, this book will show you the way. Whether you are a composer, writer, cake decorator, painter, choreographer, entrepreneur, or graphic designer, the strategies and skills demonstrated in this book will improve your output and accelerate your creativity to the stars and beyond. Get ready for an entertaining read full of both wit and practicum, and prepare to be amazed… with yourself.